You have heard of Korean BBQ or Japanese BBQ, but Thai BBQ? Well, if you have not, you’re not the only one (come on, think BBQ Plaza, does the name sound familiar to you? Well, that’s a Thai BBQ restaurant). It’s an all you-can-eat meat buffet, where you get to cook your own food! If you’re looking for a fun and interactive night out, it’s well worth the little effort you need to put in, and for 159 Baht (under RM20 per person) here at Pla Thong Mookata, you can’t really go wrong! What is a Thai BBQ? To really enjoy an authentic Thai BBQ and mingle with the locals, eat where the locals go. These “social events” take place in open air restaurants (the ventilation is really needed when there’s like a hundred mini gas BBQ pits going at once). Buffet tables are often found in the centre or the room, or off to one side, and are filled in an assortment of marinated raw meats, from an assortment of fish, chicken, beef, lamb, pork, squid and other types of seafood. The meat is thinly sliced and often available in an various marinates. The hot plate has a dip at the base, which is filled with a soup base where you can boil veggies and other stuffs from the meat drippings if BBQ-ing all the way sounds too sinful. Pla Thong Buffet is one such Thai BBQ restaurant situated only a stone throw away from Victory Monument in central Bangkok. This makes it very accessible, by either the BTS Sky Train or bus. For tourists, it’s really better to just take the BTS to Victory Monument station, from there it’s just a short stroll. This massive open-air Thai BBQ was bustling with what looked could be over 100 tables, each with 4 seats and. Centred in the back of the huge hall was a mighty meat, noodle, veggie and dessert buffet tables. The smell of the Thai BBQ’s filled the streets even before entering the restaurant. Often overlooked at a buffet style restaurant, since a buffet is really self-served, but Pla Thong Buffet has plenty of staff standing ready to assist. All it will require is a quick and simple wave to one of the waiters, and they will be at your table right away. Staff speak little English as this place is pretty much frequented by locals. But there’s really nothing much to ask from the staff anyway except drinks and changing the propane gas. You can have a trolley to put your drinks and the order chit. In here, you eat first and pay when you’re done. Apart from the variety of meat, you can also find a wide range of vegetables on one buffet line. Then there’s also finger food like sausages, croquettes, fries (or chips), rice, noodles on another table, and then you also have bread with spread (butter, jam etc) and a wide variety of pao (steam buns with fillings), and on another corner there’s the make-your-own desserts, from ice-kacang with readily shaved ice in the ice-box, Thai classic sweet and savory desserts, and a few kind of tropical fresh fruits such as guava, pineapple, watermelon, melon, etc. With such a wide selection, you can really make your money go a long way. There’s no oil to cook with, with the hot pan, they’ll give you some hot water for boiling and the best is to pick some really fat pork belly and slowly “oil” the pan for the lard to get started. 1. The easiest way to get here is by using the BTS. Get off at Victory Monument. Use Exit 2 and walk down the stairs. 2. On your left is Century The Movie Plaza. 3. In front of you is a T-junction with a corner restaurant with the name “Eat Am Are”. 4. 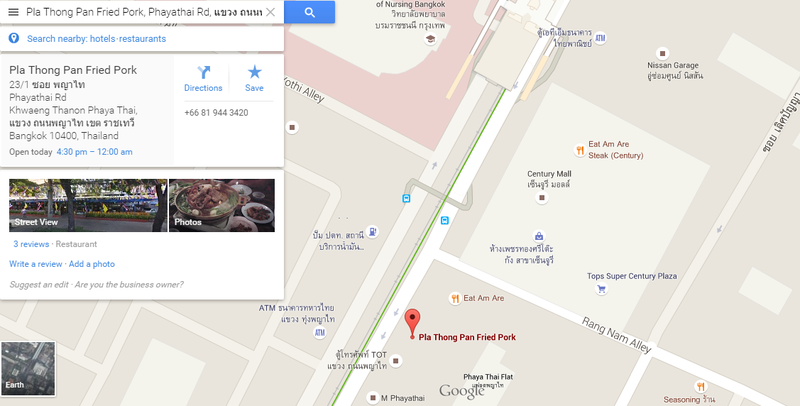 Cross the road, Pla Tong Mookata is just right beside “Eat Am Are”. You cannot miss it.. It’s just 30 seconds walk from the BTS. 1. Type “Pla Tong Pan Fried Pork”. Not any other words. 1. Just say BTS Victory Monument, in Thai, it’s actually called Anusawari Chai Samoraphan. 2. Then set your eyes on the Century The Movie Plaza, and follow the directions set out above. And for those who are visual people, this map is for you. Note: Pla Thong Mookata is a non-halal restaurant which serves pork and alcohol.